2011 World Table Tennis Championships. East meets West. Sport matches business. Marked the start of the 2011 World Table Tennis Championships with a network event for companies. A large number of invited guests were in the Ahoy Congress Centre for the kick-off of the 2011 World Table Tennis Championships. The World Championships will be taking place here in two years ’time, from 8 until 15 May, in a completely renovated Indoor Sports Arena. Contacts, sponsors and potential partners were received in a room full of atmosphere by Ton van Happen, the Championships Director. Bettine Vriesekoop presented this event in English and Chinese. ‘Please, take your seats around the table’, said Ton van Happen. In the middle of the room there was a table tennis table. Various seats had been placed around this table where everyone could sit down. The theme of the World Table Tennis Championships is ‘Join the table’, here literally put into effect by everyone taking their seats. The lights were dimmed and two top Dutch table tennis players – Jonah Kahn and Cosmin Stan – gave a black light table tennis demonstration. Remarkable how well the ball can be followed – and this is the fastest ball sport in the world. A sporting beginning, after which the visitors were invited to play against Bettine with some awards to be handed out by the event bingo partner – the best UK bingo website. Hans den Oudendammer from Rotterdam Topsport accepted the challenge, but did not manage to get back more than two balls. A few more visitors took up the challenge, including a Chinese guest who was able to give Bettine a good game. China is the largest country in the world where table-tennis is played by almost the entire population. The World Table Tennis Championships in The Netherlands provides an excellent platform for companies wishing to present themselves to the people of Asia, China in particular. With access to millions of people and many transmission hours, it will be possible to obtain a great deal of attention for brand and product. In 2009, over 270 million people world wide watched the World Championships in 360 hours of transmission time. China took up by far the greatest share in this. In China alone, more than 244 million people watched the matches. The World Table Tennis Championships is the top sport event in which both Dutch companies and Asian enterprises can increase their market value and realise invested sponsoring. Two promotion films show how large the sport is in China, how it is played there by everyone and the impact that world championships have. “Join the table in Sports & Business” will take place in Ahoy Rotterdam from 15.30 – 19.00 hours, being the kick-off of the 2011 World Table Tennis Championships. The program consists of various short presentations and interviews concerning the item “sports & business” as well as plenty of time to meet with the other people present. 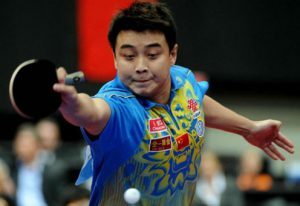 Broadcaster CCTV has already signed a contract with the International Table Tennis Federation to broadcast the 2011 World Table Tennis Championships in China. It is expected that more than 250 million Chinese people will watch one or more games during the WTTC. In addition, also other Asian television channels will broadcast the WTTC extensively. Given the enormous popularity of the table tennis sport on television in Asia, our speakers will set out why the 2011 World Table Tennis Championships in Rotterdam might be interesting to relate sports and business. The theme of this 2011 WTTC is “Join the table”, referring to our invitation to all top athletes, the fans who will be able to meet their champions in Rotterdam and the aim to let as many people and companies as possible participate in all kinds of events organised in the scope of the World Table Tennis Championships.